ANGLER offers Infrastructure Management services in Hong Kong enabling organizations to secure, optimize, manage and support their mission-critical servers, network & security appliances for its availability, utilization and more. We engage with our global clients and partners by offering apposite technology solutions and goals with enterprise strategy that drive business process as well improves the performance of data centre and security infrastructure. 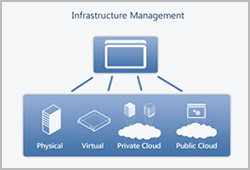 Our Remote IT Infrastructure Management Services help design, build, run and manage your IT infrastructure services in a flexible manner that allows for better integration, our RIMS assist businesses to achieve the highest levels of transformation by enabling them to get the most from their IT infrastructure services. Our robust technology and secured solution offering enables efficient delivery of services and improves overall business performance with best quality, availability and without sacrificing performance. With in-depth industry knowledge we facilitate your business to manage and monitor remotely by offering below given comprehensive solutions. Our IMS enable you to cut-cost and meet regulatory compliance, achieve operational efficiencies, exceed uptime targets, maintain information security across network, reduce operation costs and enhance service performance.